Crazy Composition Competition – Write to win a pair of opening night tickets! Let the madness of creativity take hold: enter our Crazy Composition Competition for a chance to win a pair of opening night tickets for King Lear! 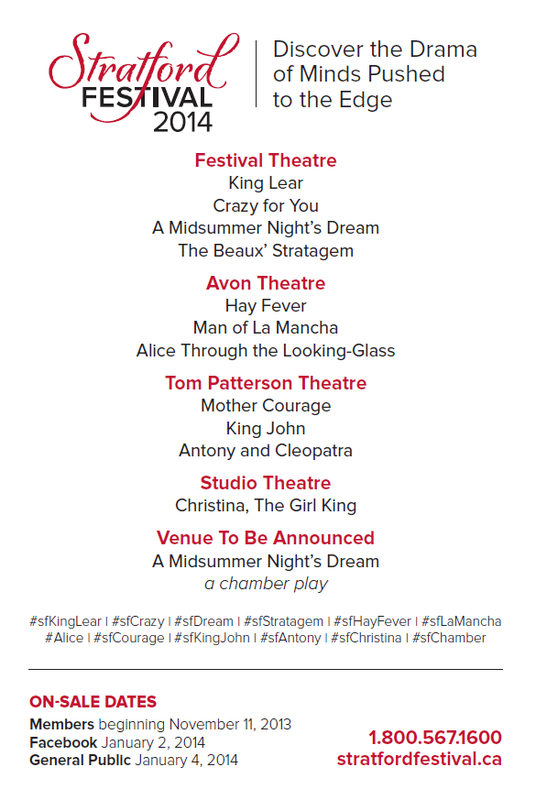 Anticipation is growing for our 2014 season, and we can’t wait to present the twelve stunning productions this coming year as we explore the theme of Madness: Minds Pushed to the Edge. Our Artistic Director, Antoni Cimolino, has carefully selected a playbill that has something for everyone. Shakespeare lovers will be mad for King Lear, Antony and Cleopatra, King John and two wildly different versions of A Midsummer Night’s Dream, while musical aficionados will go nuts for Crazy for You and Man of La Mancha. The merry madness continues with Restoration comedy making its first return to our stages in over a decade with The Beaux’ Stratagem. Rounding out the lunacy – ranging from the fantastical to the highly dramatic – is Alice Through the Looking-Glass, Hay Fever, Mother Courage and Her Children and Christina, The Girl King. We will give you and a friend opening night tickets to King Lear on May 26, 2014, two Shakespeare-lover’s journals and two copies of King Lear. All you have to do for a chance to win this unique experience is to put quill to parchment… (Okay, okay – pen to paper or fingers to your keyboard!) …and write a few lines of poetry. Watch here as Colm Feore discusses the madness of Lear in King Lear! A poem of no more than 20 lines about the Festival’s 2014 season playbill and themes. 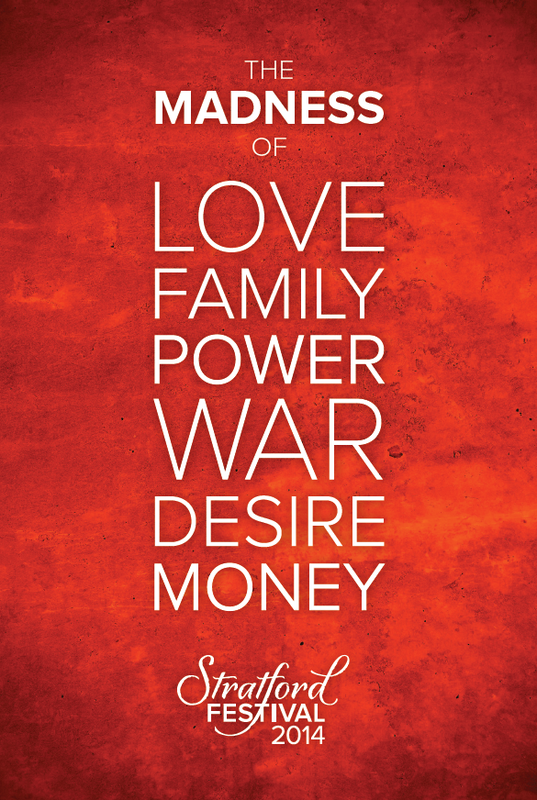 It can take the form of a Shakespearean sonnet, a haiku, a limerick, free verse – you name it! Your mailing address, e-mail address and phone number. The deadline for submissions is December 17, 2013 at midnight. Your poems will be read and reviewed by a panel of Festival staff members, and the top submission will win the prize package to be awarded on December 19, 2013. We have a season full of inspiration and a pair of tickets waiting for you, so sit down, summon up your most maniacal Muse and unleash your inner poet! *Please note that your poem will be shared on our social channels for others to read. Failure to include any of the information requested above will render your submission null and void. Current Festival staff members are ineligible to submit an entry. The five finalists of the Stratford Challenge have been chosen; groups will perform their scenes for a panel of expert judges at the Studio Theatre on May 5 for the chance to win the grand prize of $10,000. The Stratford Challenge was launched in October 2010 and asked Ontario high school students to produce a 10-minute scene from Shakespeare, record it on DVD and send it to the Festival. In its inaugural year the Challenge received close to 100 entries from high schools all across the province. A panel of 11 current and former Festival artists watched all submissions; each selected his or her top three, and from those selections the panel collectively chose the top five. Finalists will perform their scenes at the Festival’s Studio Theatre before an invited audience. The performances will be adjudicated by Artistic Director Des McAnuff, General Director Antoni Cimolino and Toronto Star theatre critic Richard Ouzounian. The first-place team will receive $10,000, to be shared by the school and the students involved in the scene. Second place will receive $2,500, and third place $1,500. Fourth and fifth-placing groups will receive $1,000 each. 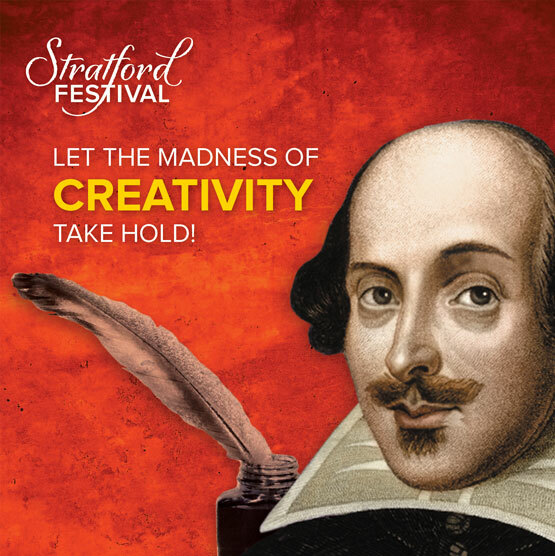 In addition to the Stratford Challenge, the Festival also issued the Shakespeare Writing Competition, which asked students to write 500 words on the topic “Why Shakespeare?” for the chance to win $1,500. The winner of the Shakespeare Writing Competition is Calvin Akler, a student at Dunbarton High School in Pickering.